At the risk of overdoing the subject of my father's wartime exploits, here is another photo of his ditched plane, clearly showing the MK-U call sign - obviously taken before the others, before the Germans towed it out of the water. It's become a bit of a quest, not to say obsession, to track down that other photo to see if I can get permission to publish it in North & South. Who liked my story so much, by the way, that they asked if I could make it a bit longer. How often does that happen? I do so love that this project has tuned into something so international. 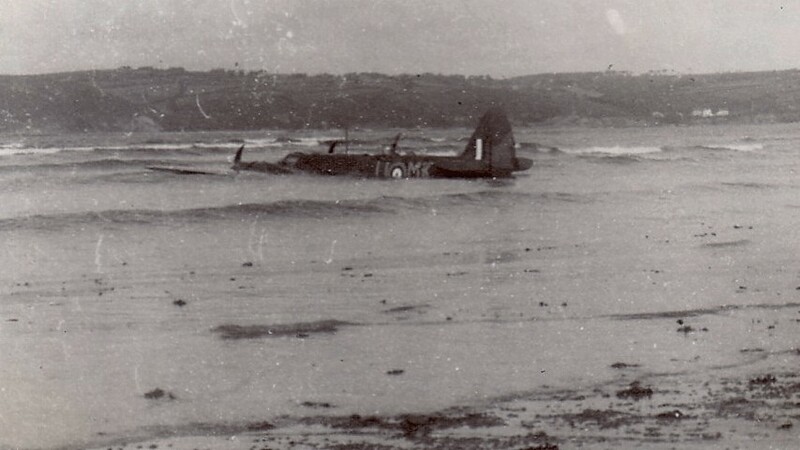 This latest photo has been sent to me from Daniel in France, who's compiling the ABSA website to record all that he can about every WW2 plane crash in Brittany during the war - aircraft details, crew, their personal details, information from people on the ground, photos... It's rather a heart-warming thing that he's doing, preserving the stories so that they're not lost, and nor are the memories of the people involved. Then there's Jonathan in England, who's helping him locate the descendants of some of the crews, and who is fortunately much cleverer on the internet than I am. On my own, blundering around eBay, I located Christiaan in Belgium who had tried to buy the photos, but was outbid in the closing seconds by another person whose details he not unnaturally couldn't remember. I settled in to plough even further through the German vendor's old listings, looking for a description that sounded right in amongst all the photos, medals, helmets and other military miscellany that had been bought by people leaving feedback in German, French, Spanish, English and goodness knows what other languages. Meantime, Jonathan located the item number on a forum - and how brilliant was that - which allowed me to go almost straight to the buyer. Who's in Canada. Only where Dad was born, and where he had a layover en route to Europe in 1941, in Nova Scotia - which is somewhere I've been hankering to go for a while now, mainly because I don't know (or thought I didn't till I got into researching Dad's story) anyone who's been there. Sigh. Again with the coincidences. Fingers crossed now that he gets in touch.